Eicher Trucks & Buses has a complete range of cargo trucks from light commercial vehicles to right up to heavy trucks. Widely referred to as mileage ka badshah, today Eicher trucks are segregated into 4 broad ranges. It starts with Eicher Pro 1000 Series, an undoubted champion in the light & intermediate commercial vehicles segment and caters to mass market. 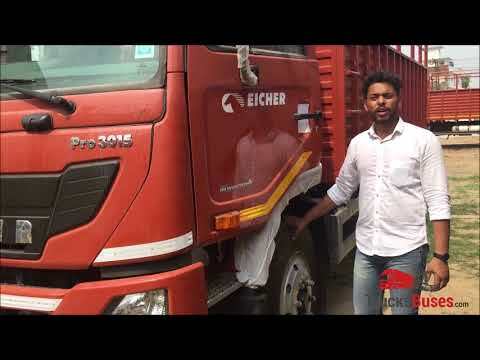 This Eicher Pro 1000 series starts from sub 5 ton with Eicher Pro 1049 truck and goes right upto Eicher Pro 1114XP. Popular cargo trucks in this series are Eicher 1110 (Pro) and Eicher 1095 (Pro). Eicher CNG trucks are also available in this range. Eicher mini truck is soon going to be a reality with VECV entering in to the Pickups segment in India. To cater to intermediate commercial vehicles segment in the premium space, from 12 Ton up to 16 tons GVW, Eicher Pro 3000 series has a couple of cargo trucks in the portfolio. These trucks are powered by an all new E494 engine, comes with a wider next gen aerodynamic cabin and are loaded with advanced features like Cruise control, fuel coaching, IDIS, etc. The popular trucks in this series are Eicher Pro 3015 and Eicher Pro 3016. In the heavy trucks space, starting from 16.2 Ton GVW & above, Eicher has different range of trucks to cater to all kinds of customers and loads. In the mass market segment, Eicher Pro 5000 series takes the command with its i3EGR technology. These heavy trucks are based on VE Series platform. Whereas, Eicher pro 6000 Series caters to customers in the emerging premium segment from 25 Ton GVW trucks & tippers to right upto 49 ton tractor trailers. These heavy trucks are powered by a state of the art, modern, aerodynamic cabin and come with host of utility features likes fuel coaching, IDIS and cruise control. Usually the heavy trucks in this GVW range are powered by 6 cylinder engine, but Eicher Pro 6000 series cargo trucks are powered by 4 cylinder VEDX5 engine. And lastly, in the high end premium segment and for extreme demanding applications, Eicher Pro 8000 Series does the duty. Eicher trucks are manufactured at Pithampur, (M.P.). To know about your favourite Eicher truck price, submit your interest for us to get back to you.